PPC tools are a PPC manager’s best friend. We couldn’t do our jobs without the many free and paid PPC tools we use on a daily basis. Probably my favorite PPC tool is AdAlysis. AdAlysis, an ad testing and analyzing tool, was created by Brad Geddes about 2 years ago. When it launched, it was a godsend. I’d been spending hours every month trying to manually analyze PPC ad copy data in spreadsheets. It can be done, but it’s so time-consuming that it’s nearly impossible to keep up with for all but the smallest accounts. That’s where AdAlysis comes in. AdAlysis uses the search engine APIs to grab data from all your PPC accounts each night. You can use AdAlysis for as many accounts in your MCC as you’d like. When you log in to the tool, you’ll see which accounts have winning ad tests. There is so much to love about this PPC tool. 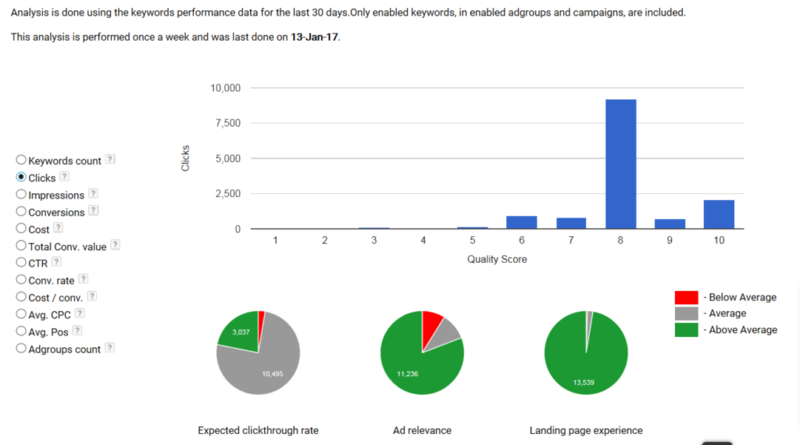 Analyze PPC ad copy tests for a number of KPIs. The interface will tell you which ads are winning for CTR, conversion rate, conversions per impression, and cost per conversion. It will show you the confidence level of each test, and indicate with red and green the winners. A note about conversions per impression: Brad has talked in several blog posts about why conversions per impression makes sense. In a nutshell, each time your ad is shown is an opportunity for a conversion. Conversions per impression takes both CTR and conversion rate into account, in essence. And you can see by the screen shot above why I like to use it. In the test above, the top ad is winning for CTR, but the bottom ad is winning for conversion rate and cost per conversion. Conversions per impression is too close to call. We need more data to determine the winner of this test. Flexible test parameters and confidence levels. You decide, on an account by account basis, how many impressions, clicks, and conversions you need in order to determine a test winner. You also determine the confidence level. I usually stick with 90% – this isn’t brain surgery, it’s just PPC. But if you want a higher level of confidence, you can set it. Multi ad group tests based on line of text or label. One of the things that’s so hard to do manually is to analyze ad tests across multiple ad groups. If your account is well-structured, chances are you have multiple ad groups for a single product. With AdAlysis, you can group those ad copy tests into a multi-ad group test. AdAlysis will look for ads with the same headline or description; or you can structure your tests by labels. I have run tests across an entire account on calls to action, for example, using labels. Quality score analysis by multiple metrics. AdAlysis is more than just a PPC tool for ad copy testing. There is also a built-in quality score analysis. It’ll slice and dice quality score across 12 different metrics! It’s easy to see where quality score issues lie: in expected CTR, ad relevance, or landing page experience. Dashboard warnings for issues. AdAlysis is more than just an ad copy testing tool. You may have noticed in the screen shot at the beginning of this article that the dashboard shows more than just which accounts have winning ads. It also lists ad groups without tests, broken landing pages, keyword conflicts, and more. If you simply logged in to AdAlysis first thing each morning, you’d know which fires need to be put out first. Keyword analyses. One of the non-ad testing features I like is the keyword analysis, especially the n-gram analysis. N-grams are single words that appear in search queries, with the data aggregated by the single word across multiple queries. In this example, there are n-grams that have generated hundreds of clicks without a single conversion. I can review the list and decide if keywords that include this word need to be paused. They’re always adding new features. Seems like I see new features in AdAlysis every week! That’s probably an exaggeration, but they’re developing new and useful features frequently. A landing page analysis and account level quality score analysis are a couple recent additions. Excellent documentation and tutorials. One of the things I love about PPC tools developed by people who have run PPC accounts for years is that documentation is usually excellent. There are numerous help articles for AdAlysis, along with video tutorials. Great, flexible pricing. Pricing is based on the number of ads in the tool, across all your accounts. There is one AdAlysis interface for Google and another for Bing, so if you’re using both engines, you’ll have 2 AdAlysis accounts. Prices start at $25 per month for up to 500 ads. You can upgrade or downgrade as needed, so you’re not locked in. Seriously, it’d be worth paying $25 out of your pocket for this tool! There are a couple of minor cons – nothing to keep me from using the tool, but a review would not be complete without them. Can’t analyze tests longer than 180 days. Sometimes, for smaller accounts, it takes longer than 180 days to reach significance on a test. My guess is the limit is due to the API, but it’s unfortunate not to be able to test ads for a longer period of time. N-gram keyword filters are missing ad group and campaign filters. You can view all your keywords and negative keywords in AdAlysis, which is an unexpected benefit. But you can’t drill down for n-grams by campaign and ad group. For example, if I wanted to view n-grams for an individual campaign, I can’t do that. Now, the data is aggregated across the account, but sometimes there are negatives that should be added to one campaign and not another. I’d like to view the data at that level to make the decision. This is minor, but I’d still like the feature. If you’re not using AdAlysis already, what are you waiting for? It’s a steal for the price, and I use it nearly every day. You can test ads so much faster and more efficiently, leading to better results for your clients. Have you tried AdAlysis? What do you think? Nearly every craft uses tools to get the job done. Carpenters have hammers and saws. Doctors have expensive medical devices like MRI machines and tests. Writers have a computer (or a typewriter, or pen and paper). PPC is no different. While it’s certainly possible to manage PPC using only the AdWords and Bing Ads online interfaces, doing so will be less than optimal. I asked 20 PPC experts to share their must-have PPC tools. They responded with gusto. Here are their top recommendations for 26 free, must-have tools for PPC success. When it comes to free tools, Google is king. One-third of the tools on the list are from Google! The AdWords and Bing interfaces only go so far. They don’t tell you what happens after the ad click. Use Google Analytics to gauge bounce rate, pages visited, and many other analytical gems that will help optimize your marketing efforts. We’ve recently started using AdWords Scripts, and it’s become obvious they’re a must-have. Use them for exception reporting, daily stats, and client reporting – amongst other things. Not to be outdone, Bing Ads has some great free tools of its own. While Bing Ads Editor isn’t as robust as AdWords Editor, it’s still a must-have PPC tool for those using Bing Ads. I love this Excel plugin for keyword research. It’ll show search volume, create ad groups, and provide demographic data – all in Excel. If you’re running more than one simple Facebook Ads campaign, you need to be using Power Editor. It’s like AdWords Editor for Facebook. Use it to create audiences, play around with targeting, and create an image bank for your campaigns. OK, it’s free if your computer has Microsoft Office, which 90 percent or so of us do. Excel is necessary to analyze and manipulate PPC data. Many of the experts named it a must-have. Convertable is a free lead generation tracking service (in beta). If you aren’t ready to give Salesforce a try, check out Convertable. SplitTester is my favorite free online statistical significance tester. Just plug in clicks and CTR (or conversion rate) for 2 ad variations to see which one is the winner, and at what level of significance. Several experts suggested tools that are fixtures in any office, and yet are essential for PPC. Microsoft Outlook and Spotify were two that Lisa Sanner from PointIt finds necessary. I have to agree. Special thanks to Aaron Levy, Andrew Bethel, Arianne Donoghue, Ben Nusekabel, David Szetela, Larry Kim, Leo Sussan, Lisa Sanner, Mark Kennedy, Martin Roettgerding, Matt Umbro, Matt Vaillancourt, and Michael Madew for contributing your suggestions. In addition to these free tools, here are 18 Must-Have Paid Tools for PPC Success. Hopefully you’ve learned of a few new helpful free PPC tools from this list! What are your must-have PPC tools? Editor’s Note: This post originally appeared on Search Engine Watch on March 11, 2014. It was so popular there that I had to share it with my readers! Enjoy!